Changes are happening fast and furious for reporter Sydney Lockhart and her detective boyfriend Ralph Dixon. No sooner do they open their new detective agency, a high-profile case walks through the door. Stringer Maynard, an influential Austin businessman, wants business partner/brother-in-law Leland Tatum investigated before Tatum's campaign for governor begins. Tatum has been keeping company with an avante garde crowd whose activities might jeopardize his chances of winning the election. Maynard invites Sydney and Dixon to the famous Driskill Hotel for Tatum's formal campaign announcement. Before they can meet the candidate, a gunshot sends them hurrying into the next suite where they discover Tatum shot dead. Suddenly, their professional services turn into a murder investigation. As the suspect list grows, Sydney acquires an unwanted partner; Lydia LaBeau, the twelve-year-old daughter of one of the potential murderers. To assist Sydney in clearing her father's name, Lydia dresses up like Sherlock Holmes and begins to collect her own bag of evidence. Much to Sydney's annoyance, Lydia proves to be the smarter detective. 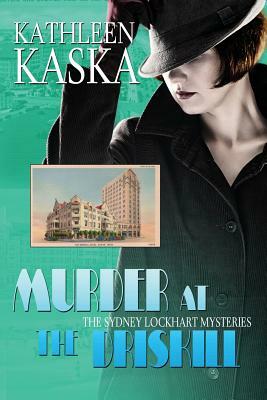 "Sydney Lockhart is one of the feistiest, funniest P.I. 's in Texas-or anywhere else '50s pop culture and a crowd of quirky characters make Kaska's latest mystery a killer read."